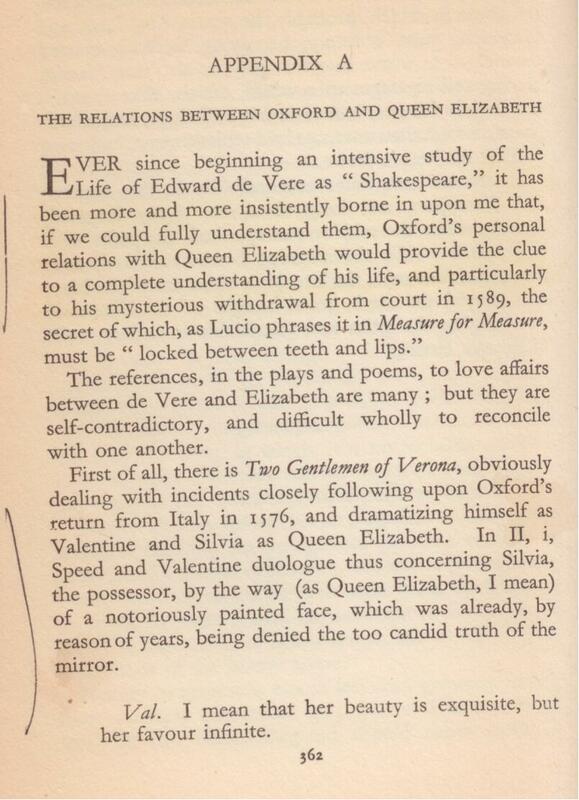 “The references in the plays and poems, to love affairs between de Vere and Elizabeth are many; but they are self-contradictory, and difficult wholly to reconcile with one another. Speed: You never saw her since she was deformed. Valentine: How long hath she been deformed? Speed: Ever since you loved her. Hi Francisco. I’m not sure Percy Allen had an answer. 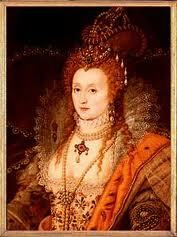 The year 1589 was a pivotal year, and the start of a pivotal period, 1589-1594, which included the marriage proposal. Most immediately it followed the execution of Mary Stuart and the destruction of the Armada — combined blows against the Catholic threat, and also paving the way for the main attention turning inward, so to speak, toward the political power struggles at home to determine the succession. And I think that in the first years of the 1590s the younger sort (Essex, Southampton, etc.) figured that (1) Burghley and Elizabeth would die in a few years and, therefore (2) the Cecils would not be able to transfer their power from father to son. But in fact all those things would happen, with Robert Cecil becoming principal secretary in 1596, two years before his father’s death. Some considerations made Oxford retire from court, remarry, try to beget an heir to his earldom and, virtually simultaneously, adopt a pen name and use it for the first and last time to dedicate any of his works, in this unique case to Southampton, thereby linking him to “Shakespeare” from then on. I think Oxford was trying to help the young earls in the ongoing political struggle to determine the next monarch. Indeed something triggered Oxford to woo the young Trentham and escape from the politic scene. She wasn’t everything he wanted, but she had what he needed. She was a major manager with her father’s will and money, as far as I know. Yet, I can’t believe Oxford would really have involved himself in the political schemes of Essex and his followers. Our poet’s relationship with Southampton was something independent of the latter’s friendship with the proud young earl of Essex. They hated it each other: Oxford hated Essex, Essex hated Oxford. This wasn’t new for none: they were both poets of proud nature and hot wit trying to find somewhere to fit in the court life of England’s Diana. It seems Oxford quitted in the late 1580’s but that wouldn’t make him Essex’ friend, anyway. Burghley’s and Elizabeth’s deaths were predictable in the 1590’s. So was Essex’ behavior. I don’t think Oxford was helping the his faction to choose sucession. He had his candidate (nop, not Southampton). ‘Julius Caesar’, I believe, was rewritten from the early 1580’s to project the late 1590’s reality, trying to intimidate Southampton to not enjoy in any of Essex’ political moves towards the Royal Crown. This failed. The square behind Essex’s faction (the Earl himself, Penelope Rich his sister, her lover Charles Blount, and Southampton) took the way of Rebellion and were in disgrace until the fallen Mary’s son came around. I don’t even think it was Shakespeare’s play the one which was performed campaigning towards this Absalom-like rebellion. Evidences don’t point out that directly it was Shake-Speare’s. All this is interesting, Francisco, but I believe nothing was written in stone — in other words, alliances and motives and goals shifted as time passed and circumstances continued to change. Oxford’s withdrawal from court in 1589 was, in my view, motivated by several factors. Among them was his need to remove himself from the court so that Southampton could suddenly step forward — and he certainly gained the public spotlight quickly, recognized as special by Elizabeth, and then “Shakespeare” added to the young man’s luster with those two dedications in 1593 and 1594. Oxford was taking himself out of the equation and concentrating on getting his finances back in order, on begetting an heir to the Oxford earldom, and revising his plays into works of dramatic literature. But he had linked Southampton to “Shakespeare” uniquely, and irrevocably. How do you suppose the Lord Chamberlain’s Men, who had performed Richard II and regarded the 1601 performance as that of “an old play,” would have performed any other play about Richard II and Bolingbroke (Henry IV)? Hayward’s work on the subject was not a play, in any case. I agree with you about Oxford warning Southampton against Essex…. 1589 was when The Arte of English Poesie was published too. Since Burghley had apparently already used George Puttenham to write or front a defense of the execution of Mary Queen of Scots, Elizabeth may have been suspicious when this incorrigible criminal (who had been stepfather of de Vere’s Windsor brother-in-law but spent much of the prior decade in prison or on the lam) suddenly produced this exhaustive study of poetry and courtiership which praised De vere first and foremost and also made inappropriate and intimate reference to her majesty. That would be a good enough reason to warrant her mistrust. Thanks for pointing this out, Mystikel. I’ll try to get hold of that piece of work by Steven May.